← Day 49: See Snow Patrol Live. Day 50: Vegan Baking Workshop. I know for some people, the word vegan brings to mind an almost entirely different species of extreme granola hippie types, who step over ants in an attempt not to harm any living creature, on their way to rescue baby chicks that they will adopt as pets, in their clothes made out of recycled potato sacks, all in an effort to save our planet and every single animal that breathes its air. In fact, I may even be closely related to a few of these assertive, bacon-loving carnivores with just such a mindset. The reality is that vegans are people, too, and not all of them have granolier-than-thou attitudes, constantly trying to espouse the merits of beans and tofu. In fact, some of them just have digestive problems or allergies, and this type of diet keeps them in their happy place. So when I read about a vegan baking workshop happening at the Evergreen Brick Works (EBW) as part of their Green Bites series, my curiosity was piqued. As a purveyor of scrumptious cookies and cakes for pretty well as long as I can remember (which usually isn’t saying much, but in this case, I’d put that back to when my birthdays were still counted in single digits), the concept of baking something without eggs, milk, butter or cheese was downright mystifying. The clincher that pushed me to enrol in the class was that the desserts were also going to be gluten-free. Between my goddaughter being vegan, and one of my best friends being diabetic, I figured there was something here that I should learn. 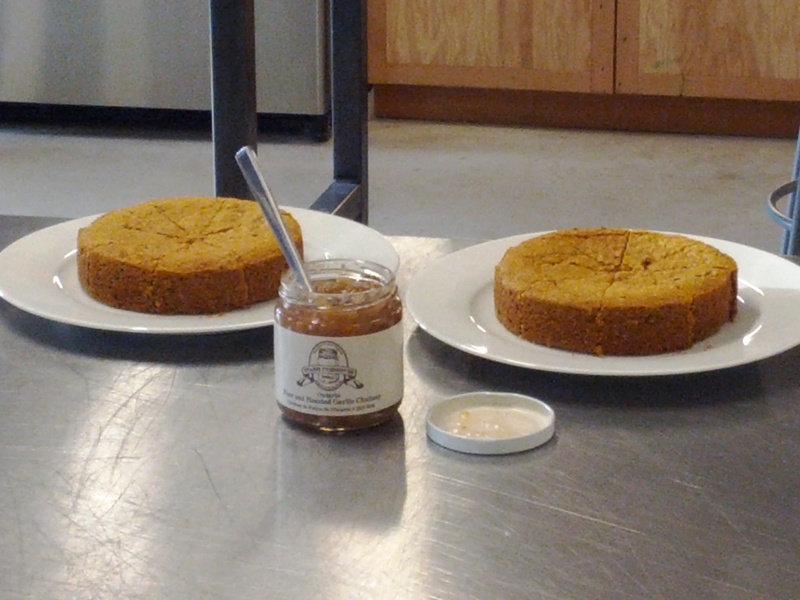 Upon arriving, we were greeted with vegan and gluten-free cornbread that was made even more delectable by spreading a local savoury pear and roasted garlic chutney on it. Besides love, the cornbread was made with dried chanterelle mushrooms, of all things! The vegan twist was the use of brown rice milk, guar gum, coconut oil and maple syrup instead of the usual suspects (although agave nectar could have been used instead of the maply goodness). As many of the ingredients as possible for everything in the workshop tonight, including the chutney, were sourced at the EBW market this past Saturday by Lesia Kohut, our instructor and owner, as well as head cake baker, at LPK’s Culinary Groove (which, if you haven’t been and tried their (not-quite-vegan) spicy chèvre noir shortbread, you have been missing out big time – they are simply incredible!). Now that the dragons in our bellies had subsided their growling, we were able to focus on the next activity, which was to prepare a vegan and gluten-free chocolate fudge cake. The chocolate smelled amazing, and was courtesy of Chocosol, a company that promotes horizontal trading, which takes ethical, fair trade to an entirely new level. 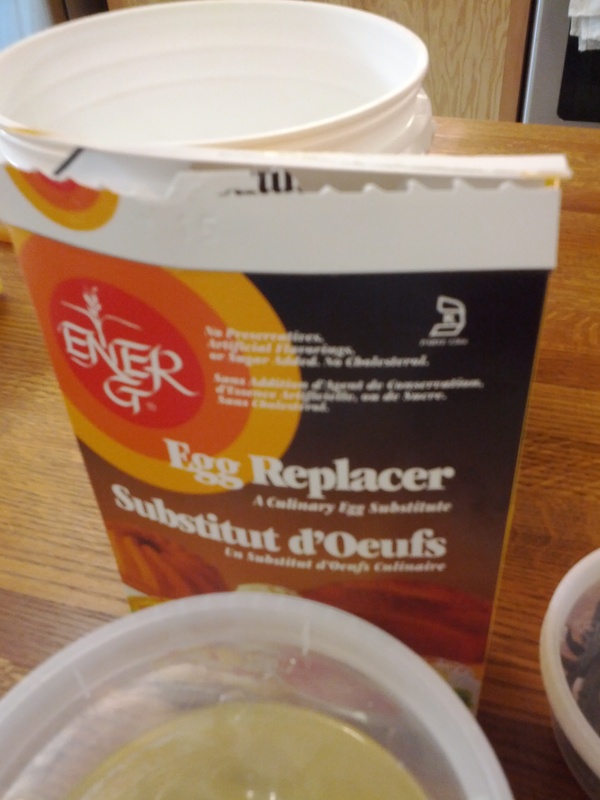 This was also my first experience using a ‘vegan egg replacer’, which comes in a box, and resembles cornstarch in its consistency. It gets whisked with water until smooth, and looks nothing at all like eggs. The other vegan elements that would not normally find their way into my mixing bowl were cane sugar, shredded beets, tapioca starch, gluten-free flour (a blend of brown rice flour, chickpea flour, potato starch, tapioca flour, and sorghum flour), and, once again, the guar gum thickener. After double-checking that we had used all of the ingredients and in the right proportions, we mixed it all together, and scooped the resulting molten cake batter into muffin tins. We were encouraged to taste the concoction, after being forewarned by Lesia that it would not be what we were expecting. Did she ever get that right! I got a mouthful of beet flavour, which my brain and stomach simply could not reconcile with the beautiful, shiny rich brown liquid that looked so luscious. Needless to say, kids would not be licking this bowl clean. 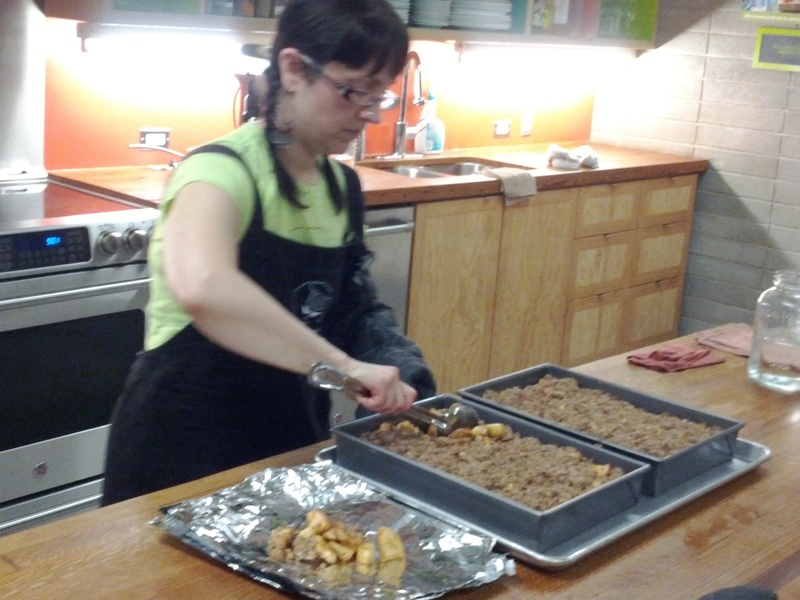 With the cupcakes in the oven, we moved onto our final recipe, which was vegan and gluten-free apple crisp. We all helped to slice the apples, and seasoned them to taste with cinnamon, nutmeg, vanilla, lemon juice, and apple cider. We decided the apples were sweet enough, so we skipped the agave nectar. Only the tapioca starch struck me as unusual here, along with some of what went into the streusel topping besides the oats, which included coconut oil, coconut sugar, and some of the gluten-free flour mix. 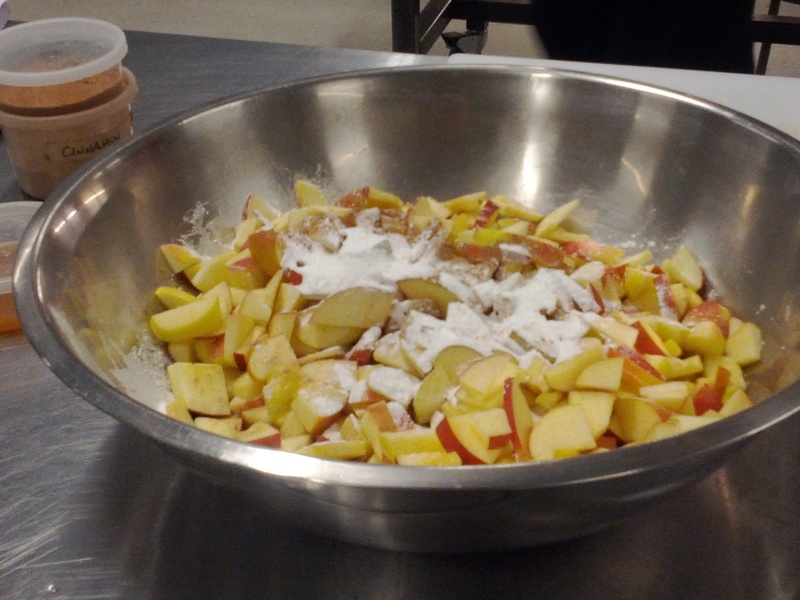 The apples were first roasted before the topping was added. Now I know how they get all the goodness inside! While that was happening, Lesia let us frost some chocolate cupcakes she had pre-made and brought with her. 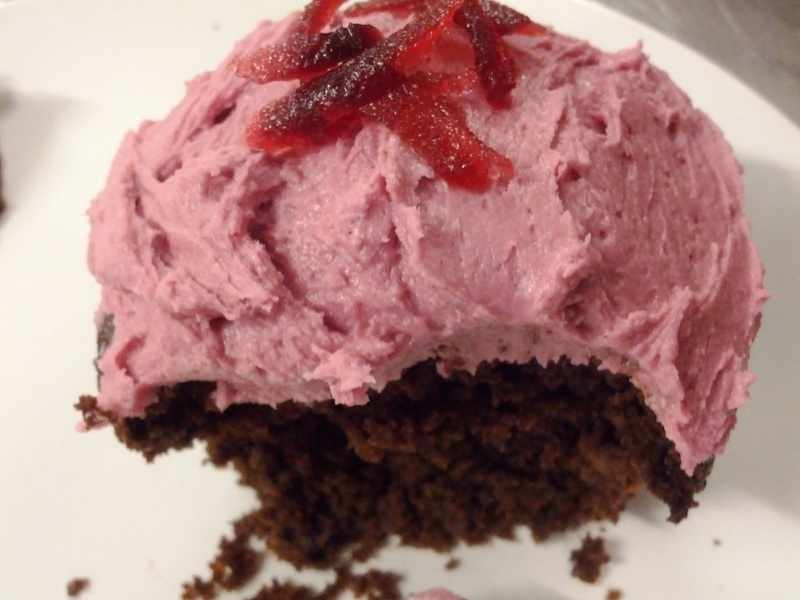 The icing contained a shortening made from a blend of cooking oils, powdered sugar, vanilla bean, and, surprisingly, a little beet juice to make it a pretty shade of pink. It was perfectly fluffy, creamy and delicious, and, fortunately, tasted nothing at all like the batter. We each devoured our cupcake in no time flat. We then took the ones we made out of the oven, and packed each one up into tinfoil, with a side baggy of frosting to add once it got a chance to cool. We similarly packed up a serving of the apple crisp to take away with us. It smelled heavenly! I was already wondering how hard it would be to eat it while driving, and decided to put it on the back seat of the car to avoid temptation on the way home. I have to acknowledge that I am delightfully surprised at just how tasty everything was. Most guests would not have a clue if you served them these desserts that they were vegan and gluten-free. We’ve certainly come a long way from the shockingly upsetting taste of carob chips in the health food stores my mom took us to when I was a kid. They are supposedly a substitute for chocolate chips, and are touted as a ‘safe chocolate alternative for dogs’. Whatever! I’d bet even dogs would spit them out, although they would certainly gobble up every last morsel of the desserts we made tonight. Not that there’d be a crumb for them to get off of my plate. Yum! This entry was posted in Educational, Food and Drink and tagged April, Drink, Educational, Evergreen Brick Works, Food, Green Bites, Lesia Kohut, LPK's Culinary Groove, Toronto, Vegan Baking Workshop, workshop. Bookmark the permalink.